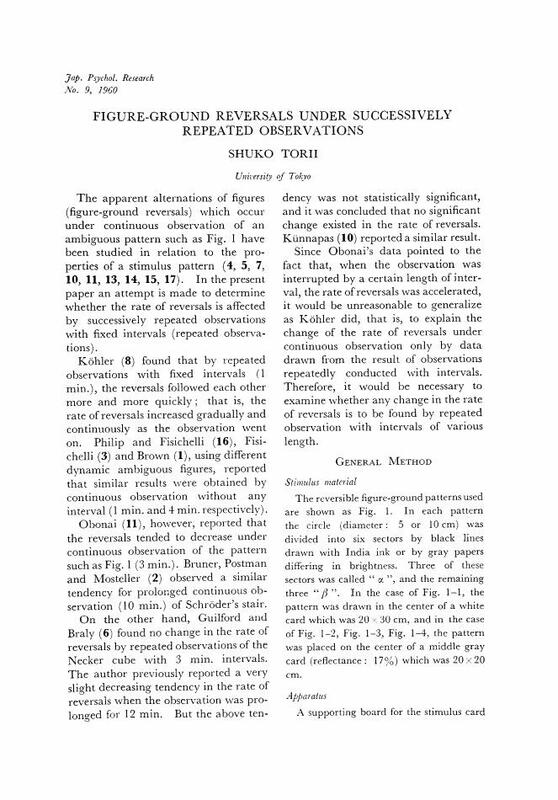 Date of correction: February 24, 2009 Reason for correction: - Correction: ABSTRACT Details: Wrong : An attempt was made to determine whether the rate of figure-ground re-versals is affected by successively re-peated observations with fixed intervals. Under repeated observations of the same reversible pattern as was used by Kohler with various intervals (0, 10, 60, 120 sec.) including Kohler's (60 sec. ), no statistically significant trend in the rate of reversals as a function of succes-sive observation was observed. Com-parison of the rate of reversals for each interval showed that the one for 10 and 60 sec. interval tended to be higher than that for O sec. (i.e., without an interval), that for 10 sec. being the highest. Examination using another pattern showed the same result, except that the rate of reversals for a 60 sec. interval was higher than that for 10 sec. This differ-ence in the rate of reversals between a 10 and a 60 sec. interval was not effected by shortening the observation time. When longer observations were used this difference was obtained with all the stimulus pattern including Kohler's. The course of change in the rate of reversals under continuous observation were incompatible with Kohler's data, in that in some cases the rate of reversals tended to decrease gradually. Under longer continuous observation (120 sec.) repeated with a 10 sec. interval the same tendency was observed. From these findings it was concluded that intervals increased the rate of re-versals, and that if an optimum length of observation time and interval were combined, the influence of interval would be most effective. Date of correction: February 24, 2009 Reason for correction: - Correction: CITATION Details: Wrong : 1. BROWN, K. T. Rate of apparent change in a dynamic ambiguous figure as a func-tion of observation-time. Amer. J. Psychol., 1955, 68, 358-371. 2. BRUNER, J. S., POSTMAN, L., & MOST-ELLER, F. A note on the measurement of reversals of perspective. Psycho-metrika, 1950, 15, 63-72. 3. FISICHELLI, V. R. Reversible perspective in Lissajous figures; some theoretical considerations. Amer. J. Psychol., 1947, 60, 240-249. 5. GRAHAM, C. H. Area, color, and bright-ness difference in a reversible configura-tion. J. gen. Psychol., 1929, 2, 470-481. 6. GUILFORD, J. P., & BRALY, K. W. An experimental test of McDougall's theory of extroversion-introversion. J. ah-nonn. soc. Psychol.. 1931, 25, 382-389. 7. HARROWER, M. R. Some factors deter-mining firure-ground articulation. Brit. J. Psychol., 1936, 26, 407-424. 8. K&ouml;HLER, NA'. Dynamics in Psychology. 1940. 9, K&ouml;HLER, W., & WALLACH, H. Figural after-effects. An investigation of visual processes. Proc. Amer. philos. Soc., 1944, 88, 269-359. 10. K&Uuml;NNAPAS, T. 11. Experiments on figural dominance. J. exp. Psychol., 1957, 53, 31-39. 11 OBONAI, T. A study of figure-ground reversal from the stand-point of induc-tion-theory. Jap. J. Psychol., 1949, 19, 177-183, (In Japanese). 12. OYAMA, T. Personal communication. July, 1958. 13. OYAMA, T., & SASAMOTO, S. Experimen-tal studies of figure-ground reversal (II). The effects of brightness, brightness gradient and area in the tachistoscopic presentation. Yap. Y. Psychol., 1957, 28, (Japanese, text 18-27; English summary, 64-65). 14. OYAMA, T., & TORN, S. Experimental studies of figure-ground reversal (I). The effects of area, voluntary control and prolonged observation in the continuous presentation. Yap. J. Psychol., 1955, 26, (Japanese text, 178-188; English summary, 217-218). 15. OYAMA, T., TORII, S., & HAMAMOTO, N. Experimental studies of figure-ground reversal (III). The influence of size, brightness gradient, illuminance and the number of sectors upon the rate of re-versal. Yap. J. Psychol., 1957, 28, (Japa-nese text, 210-222; English summary, 249-250). 16. PHILIP, B. R., & FISICHELLI, V. R. Effect of speed of rotation and complexity of pattern on the reversals of apparent movement in Lissajous figures. Amer. J. Psychol., 1945, 58, 530-539. 17. TORN, S. A study of the variables effect-ing figure-ground reversal. (unpublish-ed). Right : 1. BROWN, K. T. Rate of apparent change in a dynamic ambiguous figure as a function of observation-time. Amer. J. Psychol., 1955, 68, 358-371. 2. BRUNER, J. S., POSTMAN, L., & MOSTELLER, F. A note on the measurement of reversals of perspective. Psychometrika, 1950, 15, 63-72. 3. FISICHELLIV, R. Reversible perspective in Lissajous figures ; some theoretical considerations. Amer. J. Psychol., 1947, 60, 240-249. 5. GRAHAM, C. H. Area, color, and brightness difference in a reversible configuration. J. gen, Psychol., 1929, 2, 470-481. 6. GUILFORD, J. P., & BRALY, K. W. An experimental test of McDougall's theory of extroversion-introversion. J. abnorm. soc. Psychol., 1931, 25, 382-389. 7. HARROWER, M. R. Some factors determining firure-ground articulation. Brit. J. Psychol., 1936, 26, 407-424. 8. KÖHLER, W. Dynamics in Psychology. 1940. 9, KÖHLER, W., & WALLACH, H. Figural after-effects. An investigation of visual processes. Proc. Amer. philos. Soc., 1944, 88, 269-359. 10, KÜNNAPAS, T, M. Experiments on figural dominance. J. exp. Psychol., 1957, 53, 31-39. 11 OBONAI, T. A study of figure-ground reversal from the stand-point of induction-theory. Jap. J. Psychol., 1949, 19, 177-183, (In Japanese). 13. OYAMAT, T. & SASAMOTO, S,. Experimental studies of figure-ground reversal (II). The effects of brightness, brightness gradient and area in the tachistoscopic presentation. Jap. J. Psychol., 1957, 28, (Japanese text 18-27 ; English summary, 64-65). 14. OYAMA, T., & TORII, S. Experimental studies of figure-ground reversal (I). The effects of area, voluntary control and prolonged observation in the continuous presentation. Yap. J. Psychol., 1955, 26, (Japanese text, 178-188 ; English summary, 217-218). 15. OYAMA, T., TORII, S., & HAMAMOTO, N,. Experimental studies of figure-ground reversal (III). The influence of size, brightness gradient, illuminance and the number of sectors upon the rate of reversal. Jap. J. Psychol., 1957, 28, (Japanese text, 210-222 ; English summary, 249-250). 17. TORII, S. A study of the variables effecting figure-ground reversal. Date of correction: February 24, 2009 Reason for correction: - Correction: CITATION Details: Wrong : 1. BROWN, K. T. Rate of apparent change in a dynamic ambiguous figure as a function of observation-time. Amer. J. Psychol., 1955, 68, 358-371. 4. GOLDHAMER, H. The influence of area, position, and brightness in the visual perception of a reversible configuration. Amer. J. Psychol., 1934, 46, 189-206. 9. KÖHLER, W., & WALLACH, H. Figural after-effects. An investigation of visual processes. Proc. Amer. philos. Soc., 1944, 88, 269-359. 10. KÜNNAPAS, T. M. Experiments on figural dominance. J. exp. Psychol., 1957, 53, 31-39. 11. OBONAI, T. A study of figure-ground reversal from the stand-point of induction-theory. Jap. J. Psychol., 1949, 19, 177-183,(In Japanese). 13. OYAMA, T., & SASAMOTO, S. Experimental studies of figure-ground reversal (II). The effects of brightness, brightness gradient and area in the tachistoscopic presentation. Jap. J. Psychol., 1957, 28,(Japanese text 18-27; English summary, 64-65). 14. OYAMA, T., & TORII, S. Experimental studies of figure-ground reversal (I). The effects of area, voluntary control and prolonged observation in the continuous presentation. Jap. J. Psychol., 1955, 26,(Japanese text, 178-188; English summary, 217-218). 15. OYAMA, T., TORII, S., & HAMAMOTO, N. Experimental studies of figure-ground reversal (III). The influence of size, brightness gradient, illuminance and the number of sectors upon the rate of reversal. Jap. J. Psychol., 1957, 28,(Japanese text, 210-222; English summary, 249-250).